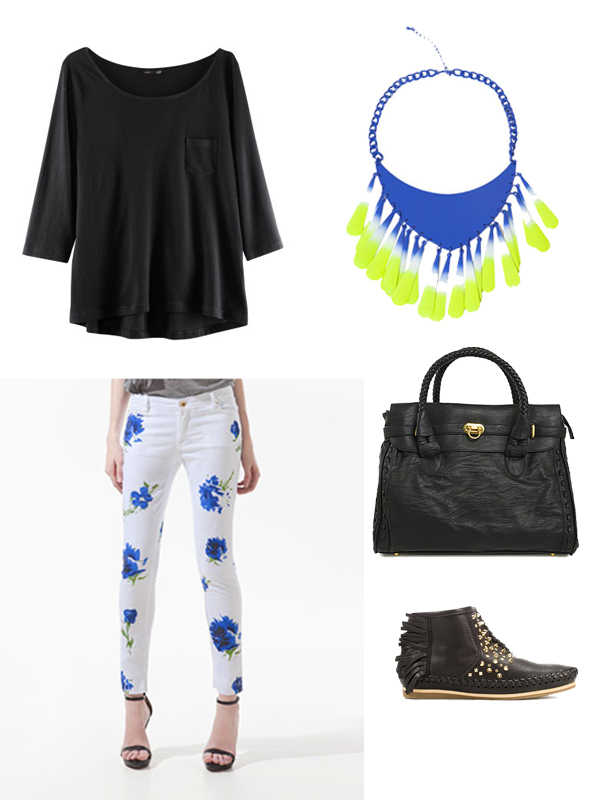 First Blue Shoes: Outfit Ideas "Blue Monday"
Ok this outfit isn't blue but I'm obsessed with this blue and neon yellow necklace! These two colors together are just wow! Love it! :) I don't know what is it with me but always when I see interesting color combination I'm so in love with it, just makes me so happy! I think Zara currently have so many amazing statement necklaces, I have to go check them out. This is something I would definitely wear to college. I think it would look great with heels like the ones in the picture with jeans or maybe with ankle boots but I prefer flats for college so this is something I would wear. I also love ankle booties like this, this one has fringes which I love (I already have two very similar) and this one also has little studs which gives them edge. I would actually wear this with a jacket (leather probably) because it's not warm enough to go with just a t-shirt. That necklace is so amazing, I love it! I love those pants! I dont know if I could ever pull them off, but if I could I would def wear them! Oh my goodness so in love with this outfit inspiration. And you're so right the blue and yellow are just like WOW!! !